Wake up refreshed and ready for the day. Our rooms are not your average hotel rooms. 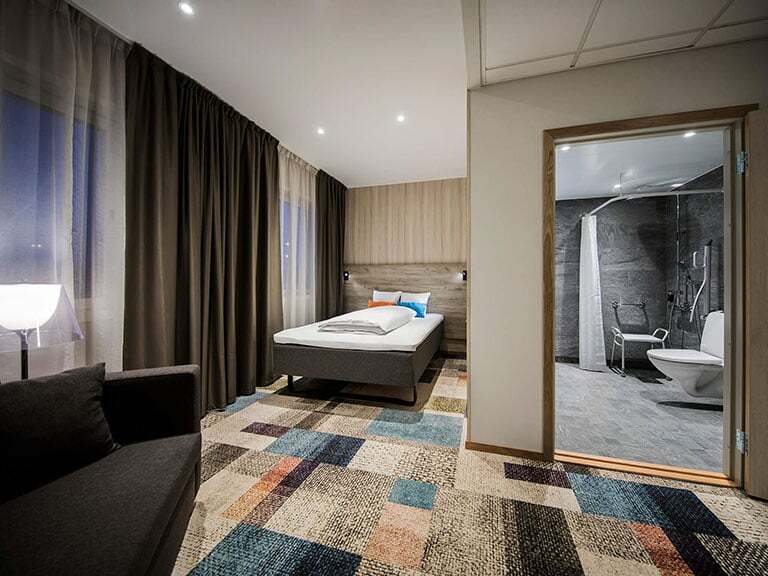 Arenahotellet has 200 rooms, and sleeps 620 people in total. All of the hallways are decorated and tailored around different sporting disciplines and requirements. For example, we have en entire hallway of wheelchair-friendly rooms for athletes with disabilities and an entire hallway of rooms that are tailored to meet the needs of our taller guests. 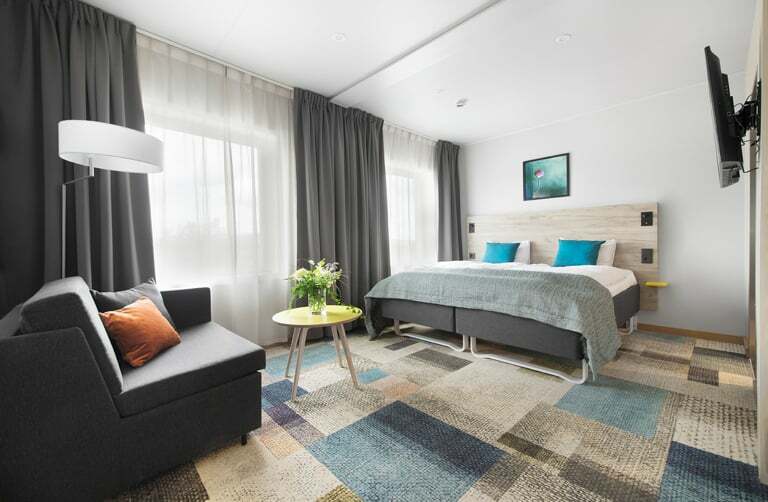 It is not unusual for volleyball and basketball players to be somewhat taller than average, which is why Arenahotellet offers beds that have been designed for guests who are over 6 1/2 feet tall. The hotel has 200 rooms with 620 beds in total. Each wing has a different sports theme. Among the various wings, one is designed for athletes using wheelchairs, another for basketball players with extra long beds and another has family rooms for up to 8 people. For our younger guests, we have a gaming room with Playstation, X-Box and more. The hotel offers complimentary Wi-Fi, TV and air conditioning. On the eighth floor, we have a relaxation centre with a beautiful view of Uppsala. The parking lot has 26 spaces, four of which are disability accessible. There are also seven charging stations for electric cars. If you are visiting us as a family, then we want to you stay at Arenahotellet as a family. Here you will find rooms that can accommodate up to 8 people, and we also have a gaming room for the children with things like a Playstation and an Xbox. Our single rooms are 11m² and our double rooms are 22m². Single rooms are furnished with a 140cm queen size bed and double rooms have a double bed, as well as a bed sofa and coffee table. The entire hotel has air conditioning, TV and complimentary Wi-Fi. You have an en-suite bathroom with a toilet and shower, basic shoe storage, an open wardrobe with hooks and hangers and a work station with a desk and chair. Our double rooms also have armchairs and a coffee table. Hairdryers and ironing boards can be borrowed from reception. We offer 19 wheelchair-friendly rooms in total. Naturally, all of our public spaces have been designed to ensure you can get around without any obstacles in your path.